Europe's first polar-orbiting weather satellite finally took a ride into space aboard a Russian Soyuz rocket today to begin a five-year mission observing the world's climate. 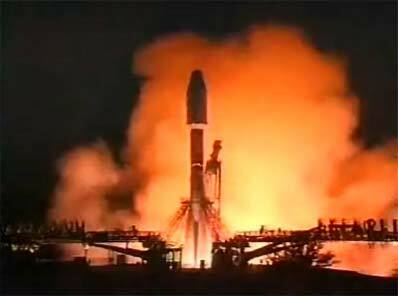 Liftoff was at 1628 GMT (12:28 p.m. EDT) from pad 31 at the Baikonur Cosmodrome in Kazakhstan's barren desert. The three-stage Soyuz/ST rocket delivered the satellite and a Fregat upper stage to a parking orbit about nine minutes after launch. The Fregat used two burns to finish the task of putting the payload in the planned Sun-synchronous orbit more than 500 miles high with an inclination around 98.7 degrees. Separation of the satellite came about an hour and nine minutes after liftoff, and ground stations soon acquired radio signals from the craft. Tucked inside the rocket's bulbous nose cone was the 9,000-pound MetOp-A weather satellite. Six months of systems checks will ensure the spacecraft is healthy before it is pressed into operational service next year. The flight was originally scheduled to launch in July, but three consecutive attempts were thwarted due to an array of technical issues with the rocket and ground systems. Three weeks ago, problems loading the payload and upper stage on a train caused the assembled unit to be dropped by a few centimeters. Engineering reviews later cleared the issue, but the incident still resulted in an additional delay to this week. Two more tries earlier this week ended without a launch due to a ground control problem and unfavorable upper level winds. As the first member of Europe's Meteorological Operational satellite program, MetOp-A will give forecasters a new perspective on weather phenomena. The satellite is Europe's first dedicated weather satellite to circle Earth's poles, and it is composed of parts from a dozen nations. The $3 billion MetOp program consists of three satellites, with each scheduled for launch in five-year increments to provide data continuity through 2020. Funding comes from the European Space Agency and the European Organization for the Exploitation of Meteorological Satellites, or EUMETSAT. Europe has had an active independent weather program since 1977, when the continent's Meteosat series began operating. After a total of seven Meteosat observatories were launched, ESA and EUMETSAT built follow-on spacecraft in a program known as Meteosat Second Generation, or MSG. Two MSG satellites were launched in 2002 and 2005, and a third is planned for around 2009 to take over when the first nears the end of its lifetime. MetOp-A will also work in tandem with the United States polar-orbiting satellite fleet managed by the National Oceanic and Atmospheric Administration. 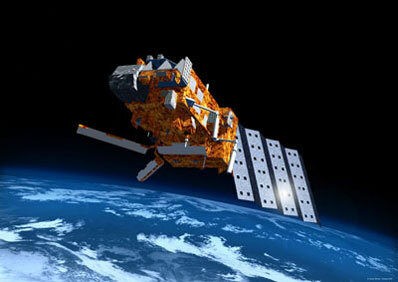 EUMETSAT and NOAA signed an agreement in 1998 creating the Initial Joint Polar Satellite System. The new system includes a MetOp satellite crossing the Equator in the morning, followed in the afternoon by a pass by a U.S. craft. The agreement also opened the opportunity for American instruments to ride into space on European spacecraft. Specific satellites included in the U.S.-European accord are NOAA-18, NOAA-N Prime, and the first two members of the MetOp constellation. Further spacecraft could be added at a later date. "The harvest of data expected from MetOp-A and its follow-on satellites will provide a new dimension to our knowledge of the Earth's atmosphere and climate," said ESA Director-General Jean-Jacques Dordain. Sun-synchronous orbits allow spacecraft to fly over different regions of Earth at the same local time by keeping in step with the Sun's position as the planet rotates below. Officials say MetOp-A's entire instrument package can cover the entire globe every five days, with much more accuracy and detail than satellites in geostationary orbit, which are used to provide real-time "big picture" observations. Until now, European forecasters in search of low-altitude weather information had to turn to images and readings gathered by the U.S. NOAA satellites. The MetOp program will also fall in line with a European initiative to provide domestic and autonomous sources for data pertaining to environmental and security issues. MetOp-A carries a suite of 13 instruments to closely observe weather systems and climate trends. Five of these are considered new and were developed in Europe. The others are provided by NOAA and the French space agency, CNES, having flown on several earlier U.S. weather satellites. The French Infrared Atmospheric Sounding Interferometer (IASI) is heralded as the most advanced instrument aboard MetOp-A. IASI can gather vertical temperature and humidity profiles in the atmosphere with unmatched precision and accuracy. The instrument can also detect concentrations of trace gases. France also built MetOp-A's data collection system and search and rescue processor, both of which are used regularly on NOAA spacecraft. The Canadian Department of Defense provides the search and rescue repeater through NOAA. 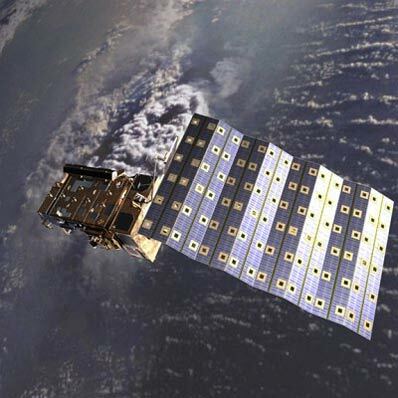 Another instrument uses radio signals passing through the atmosphere from GPS navigation satellites to extrapolate temperature and moisture content data. Also, the Microwave Humidity Sounder is flying for the second time after being carried into orbit by NOAA-18 satellite last year. A scatterometer will measure wind speed and direction, and an instrument dedicated to the study of ozone will conduct atmospheric research and help improve air-quality forecasting worldwide. Four instruments on MetOp-A are directly provided by NOAA. Two Advanced Microwave Sounding Units seek information that can be used in precipitation and surface measurements such as snow cover, sea-ice concentration, and soil moisture content. The High-resolution Infrared Sounder can measure temperatures and pressures at various altitudes in the atmosphere. This data is then applied to determine ocean-surface temperatures, precipitable water levels, and cloud height. An advanced radiometer will image land, water, and cloud features day and night. A Space Environment Monitor can detect charged particles in the vicinity of the spacecraft and gives warning of impending solar storms and other space weather events that could damage other satellites in space, or interfere with communications and power grids on Earth. Raw data from the instruments will be transmitted once per orbit to a Norwegian ground station, but ESA says anyone with a small antenna and receiving equipment can also retrieve the information from MetOp-A. This is especially important for universities, small forecasting stations, and ships. Today's Soyuz mission also had another objective. It was the first flight of a new payload fairing for the rocket family. The fairing used in the first five minutes of MetOp-A's launch was a new design with an increase in length to 11.4 meters (37.4 feet) and a diameter of 4.1 meters (13.5 feet). The enlarged shroud is similar in design to the retired Ariane 4 launcher's fairing, and it gives Soyuz customers additional payload volume for payloads. The introduction of the ST-type fairing is another step in the effort to upgrade Russia's venerable Soyuz rocket with additional capabilities and state-of-the-art technologies. In November 2004, a suborbital test launch successfully validated a new digital control system providing more mission flexibility and allowing larger payload fairings to be accommodated. Next in the stepped evolution plan will be a test flight including a more powerful third stage engine on the launcher, completing the development of the so-called Soyuz 2 rocket. This improvement will increase the booster's performance and offer more payload mass capacity to orbit. The upgrades are part of a joint program between Russia and Europe to ready the Soyuz for future launches from the European-controlled spaceport in Kourou, French Guiana. The rocket's first flight from Kourou is scheduled for 2008. The Soyuz is marketed commercially by France-based Starsem, a subsidiary of longtime launch provider Arianespace. When flights begin from the South American launch site, management of launch operations will be handed over to Arianespace. Starsem will continue to manage relations between Arianespace and Soyuz suppliers in Russia, according to the company's Web site.